Halloween is a week away! I will admit it: Halloween is not my favorite. As a kid I wondered why we had to go from door-to-door like street urchins. Why couldn’t all the neighbors just toss all their candy into a huge cauldron in the center of the subdivision and let kids take turns dipping it out? Walking from door to miserable door, enduring the snarky “And what are you dressed as?” remarks, shivering in the inevitable cold because I didn’t want to wear a coat that covered my costume, being frightened half out of my wits (which explains a lot!) by older bullies who thought it was funny to make little kids pee their pants…ugh! To make Halloween that much crazier, my parents would “inspect” our candy before we got to eat it. “Inspect.” Yeah…right. Whatever. Having said that, I put together a table just the same for your Halloween pleasure/fright. Whatever. I’m going to the store to grab a couple of bags of candy to “inspect” while you look at the pictures! 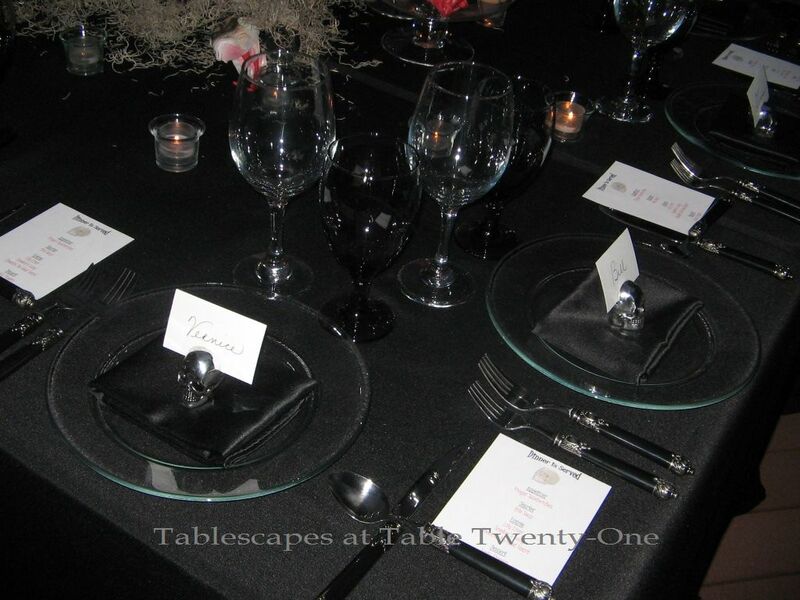 A full-length black linen creates the appearance of a ghostly “floating” tabletop design. The use of clear glass and black tabletop accessories further lends to the ethereal “floating” effect. You can pick up clear glass dishes at places like Bed Bath & Beyond or Old Time Pottery. The black stemware used here is just $1 a stem at the Dollar Tree store. Gotta love that place! Lots of bang for the buck…especially in this economy!!! The close placement of the flatware creates a “chain link fortress” around the table. Yes…I used the names of some close blogger pals like Vernice at We Three Dogs & Me for place cards. If I have to suffer through this, I’m taking you guys with me! I found the fun little skull place card holders at TJ Maxx. The dinner menu, of course, has to be pretty nauseating to be effective! The design on the end of the Hampton Silversmith’s black “San Remo” flatware works well with its almost Gothic look. I have a couple of wrought iron “trees” that come in handy for various centerpieces, and Halloween seems a pretty likely opportunity. The tree holds 20 votives in its “branches.” To give it a spooky look, I added clumps of Spanish moss, lots of skulls from Michaels craft store, and a 6-ft. python slithering from top to bottom. I bought this tree wholesale several years ago, so I can’t tell you where to buy one. Curly willow branches, manzanita branches, or any type of small tree would work just as well, though, to achieve the look. 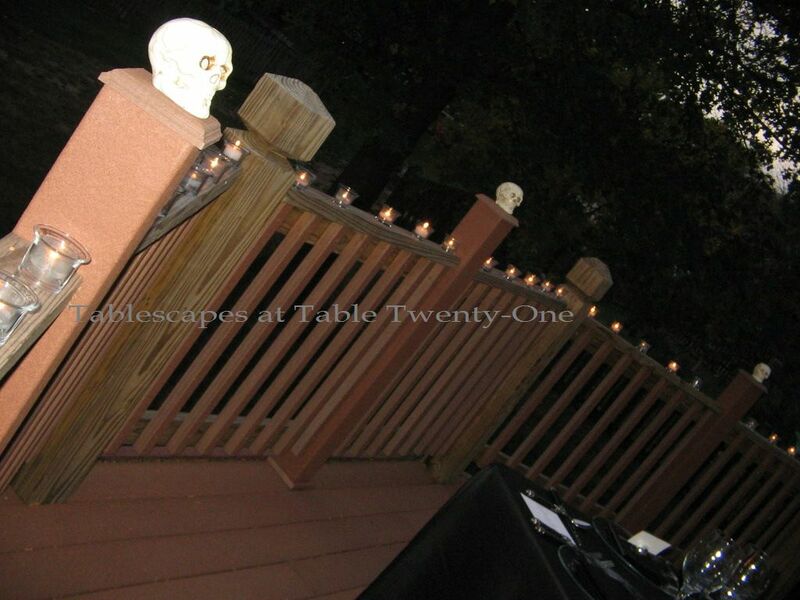 Votive candles lined up along the deck ledge with a skeleton here and there provide a little more ambience. As if on cue as I finished up, a huge black cat darted from under the deck, across the yard, over the fence and into the neighbor’s yard. Oh, crud. The bully made me pee my pants…again! I’ll be joining my spooky pals at Susan’s Tablescape Thursdays again this week, so please stop by to see how much they enjoy decorating for Halloween! One would never know that this isn’t your very favorite holiday. You knocked this out of the ballpark! OK……the snake was my favorite feature. You really got me with that one. I really hope my name was on one of those place cards! That would make ME pee my pants…..,.,with excitement! This is too &%$#**@ SPOOKY! I’d be afraid to eat. I can’t wait to see how you decorate for a holiday you DO like!!! Your tablescape is most gruesome! The red of those raw delicacies against the black table is making me happy I haven’t eaten lunch yet. My favorite element has to be the tree. The votives and skulls seem to be suspended in air. Thanks for sharing and creeping me out! I’m guessing you didn’t go door to doot to sell Girl Scout cookies! OMG!!! that snake.. that made me pee my pants! Hey witchy woman, we are using the same flatware and a black tablecloth.. but you win the eerie creepy department! Loving your commentary and truly the delicacies you are serving are a delight (for ghouls i’m sure!). Love the cross on the knife and spoon. Was that to ward off the evil demons? This is great.. I love your table. It would be fun to sit at as adults.. I do love the tree! That is so cool. Especially with the grungy spanish moss dripping off the limbs.. great job!! loved every bit of it. I think you get the prize for the spookiest tablescape! I don’t really do HW, since there are no kids in my life any more. It’s always fun to see what the rest of you creative people do, though. Yikes, for someone who doesn’t like Halloween you sure went scary on me! 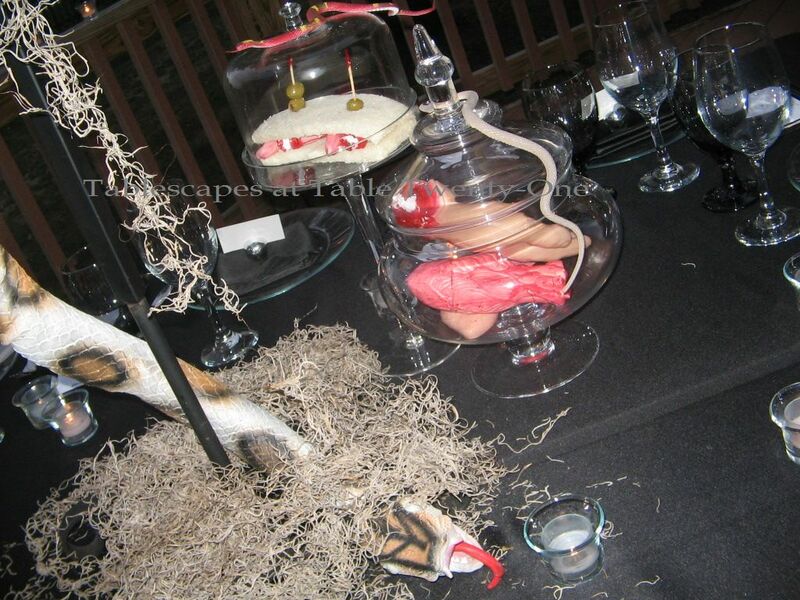 That is one scary table Alycia….That snake slithering down the tree…OMG. Love the tree with the skulls and votive candles. The black tablecloth is awesome with the so many eerie details. Great place cards and the menu is over the top. Always a pleasure….. It would be totally fun to be seated at this table although I have to admit the big snake really creeps me out! Morticia would have been proud of this!! Super job! What Fun ! I love it ! Oh Alycia, I’m still smiling after reading your Halloween experience, lol!! We really lived too far out to ever actually trick or treat, but back then, there was definitely the “inspection” for razors and such. What a cute table!! I have not done anything like that. Thanks for stopping by and for your comments!! The Rooster table was one of my favorites too. I used that several different ways and really carried it over for a while. Nice to see you!! 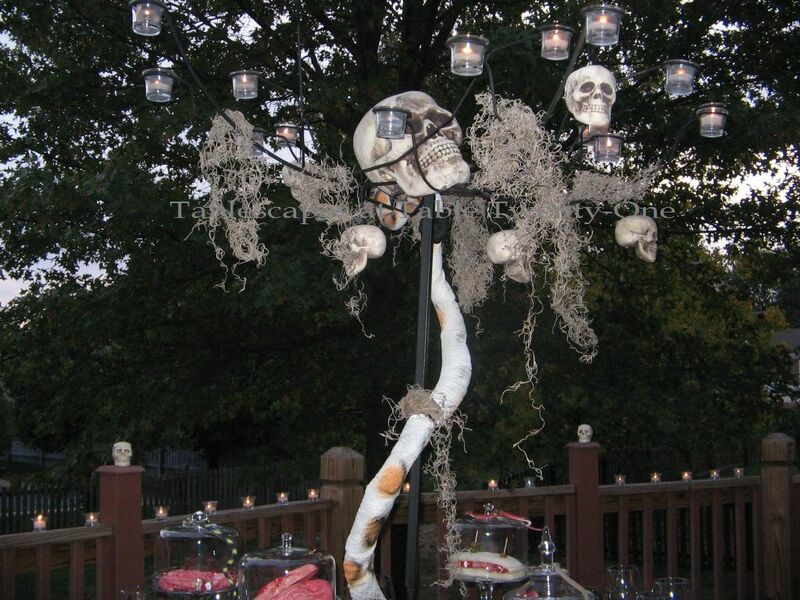 To my “umbrella sister” – you sure went all out and did a frightenly fabulous job with this table! I recall my parents doing the famous candy inspection too ;o) I can’t say that I would sit down and join you at your table this week, but I did enjoy the menu cards! Oh! Oh! Oh! I see my name. (It took an email to point it out to me.) I feel like a kid who just saw Santa! I just knew she’d never leave me out. WOW – this is amazing. It’s spooky and fun and elegant all in one. Love it. Hi Alycia, well this is just so creepy and fun!!! I have always liked Halloween, and your table is just the best! 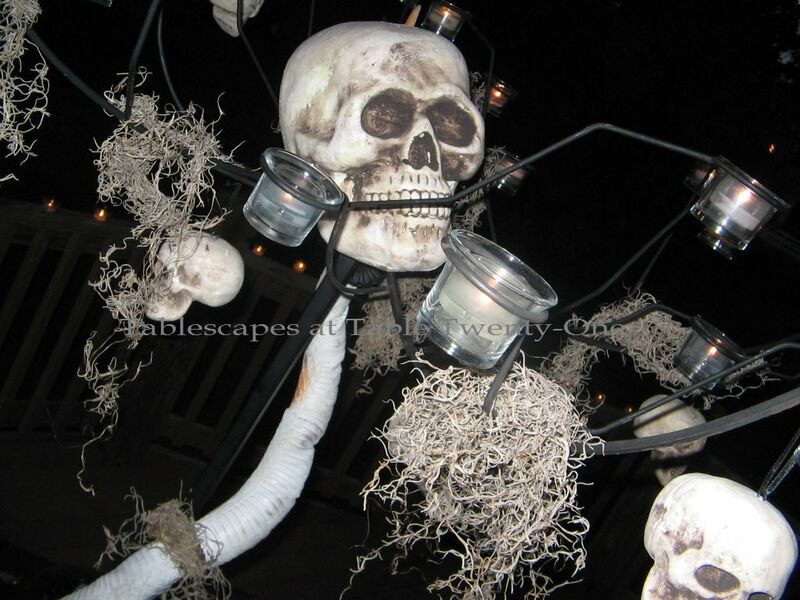 That skull votive tree is perfectly amazing and spooky! I love the thrills of it all, let’s eat and then watch a scary movie!! With the candles flickering and the serpent slithering, I’m going to be checking behind my back … love this!!! Deliciously creative, Alycia!! Perfect Halloween table! You are so funny! I am laughng at your commentary, but I’m impressed with your creativity, lady! You just got every detail perfect. And I love your tree as a centerpiece. That is one seriously scary table! You take creativity to a whole new level! Can a table be elegant and creepy at the same time? I think the use of “floating” glass dishes on that black table is fabulous! 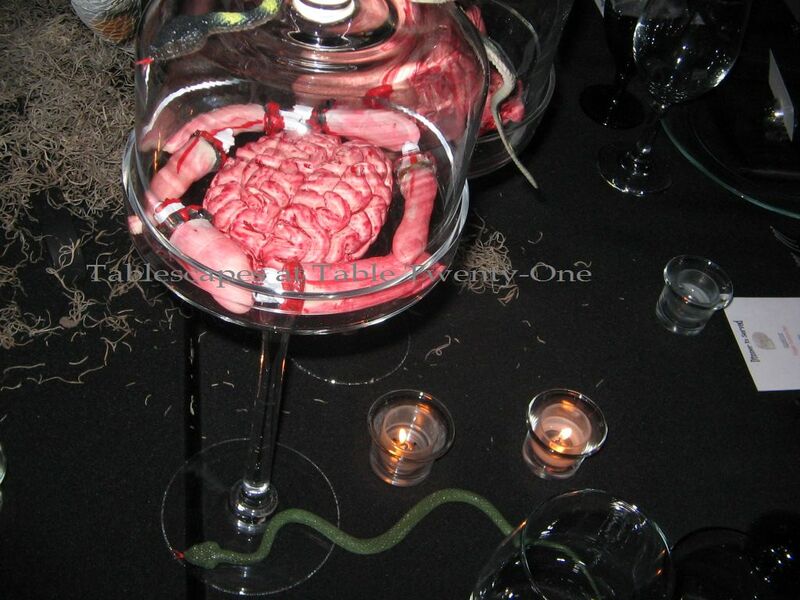 Alycia, you should win grand prize for the spookiest table…and by the way, I abhor snakes…they give me the creeps! Yikes! This scared me, especially that snake!! Very well done though! So sweet of you to offer help finding the polka dot plates! I bought them at Marshall’s, and/or TJ Maxx, and/or Home Goods last year. They were only $2.99 each! All that is on the bottom of them is: “Earthenware, dishwasher safe. Made in China.” I have them in black, red, green, and the three yellow. Whether or not Halloween’s your favorite, you got it all going in a fun spooky way. Finger sandwiches….oh my gosh, you’re really getting into the spirit of things. Suffer, you say??? I’ll suffer through that dinner party any time! Absolutely gorgeous! Wow, I think you win the creepy award for the week. Eek…I’m not sure I would want to eat with all those skulls lurking over me!!! love your flatware. I think I’ve said that before!! …To thinking how dead on (oops, maybe a bad word choice) you are about creating an ethereal “floating” feeling and a chain link fence effect with the flatware…. … To laughing with you about the black cat. All in all, Alycia, your post just rocked.Just about what I expect when I come here. Halloween isn’t my favorite tablescape theme either, and I can just about promise I’ll never tackle a “spooky” table like you did. But, with that said, you did a fantastic job! The floating effect is just perfect, and the flatware placed like a cross (were you warding off vampires?) really caught my eye. I think the mark of a honest-to-goodness tablescaper is one who can hit a homerun with a theme table even when it’s not “their thing” — and you certainly did! You even make the macabre elegant. I really love your tree. I’m going to have keep my eyes peeled (you could put them under glass on your table) for one. You hit it out of the ballpark with this one, Alycia!! I LOVE the “San Remo” flatware you used along with all the other dark & foreboding elements. Crossing the spoon over the knife was a brilliant touch!!! So creative! For someone who doesn’t love Halloween spooky — WOW! This is amazing — and the night outside setting is just perfect — skulls and black — I scared! Oh. my. goodness. Alicia, for someone who doesn’t like Halloween, you sure know how to “do it up” well!! Great job, and thanks so much for stopping by. Maybe this year you will leave the outside light ON!!! LOL!! Oh my gracious! So creepy, I love it!! Perfect for Halloween! Wow, you are scary! That snake and the skulls – eek! I was just the opposite – loving it all – but my mom was with us so we never got bullied! 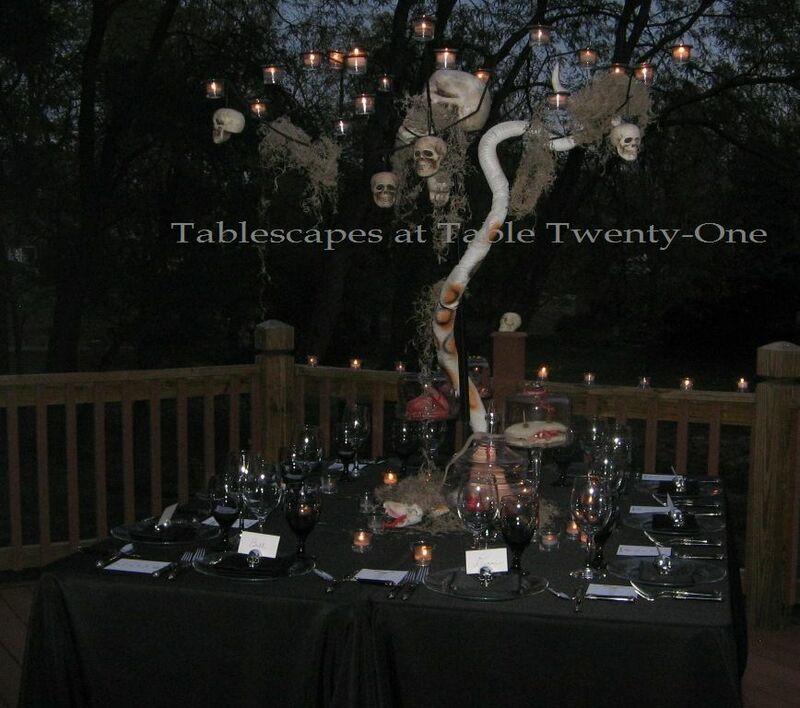 For someone who doesn’t like it, you put together one ghoulish table. How do you do it? You don’t like the holiday and yet you put together a perfectly scary, creepy, SPOOKY table! 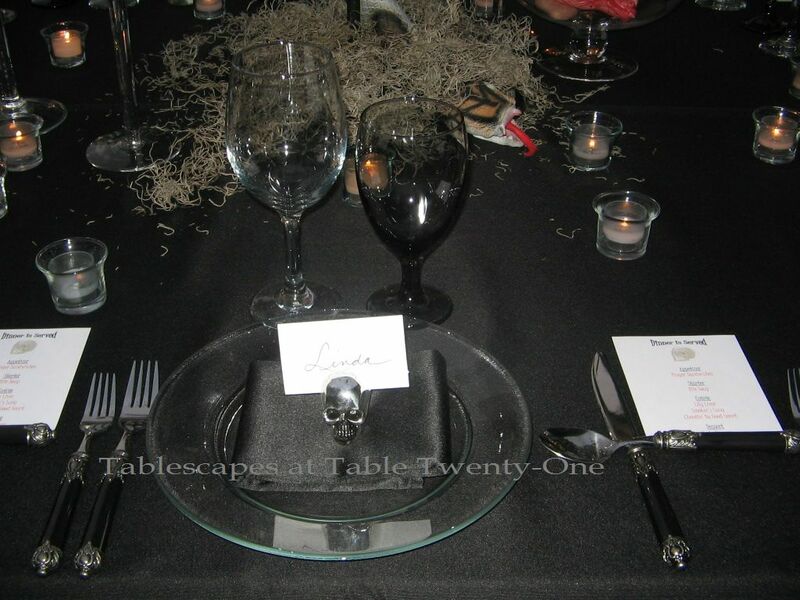 I love the look of the black linen and the clear plates. You did a great job! Loved each and every bit of it! Great table but that is no surprise. My hubby would like the place card holders. Alycia, you just never cease to amaze me! What a stunning table for such a spooky holiday! LOL! Love the black linens…they really set the tone! Love all the “creepy” elements!! Eerie…but, great nonetheless! You just always do a great job!! 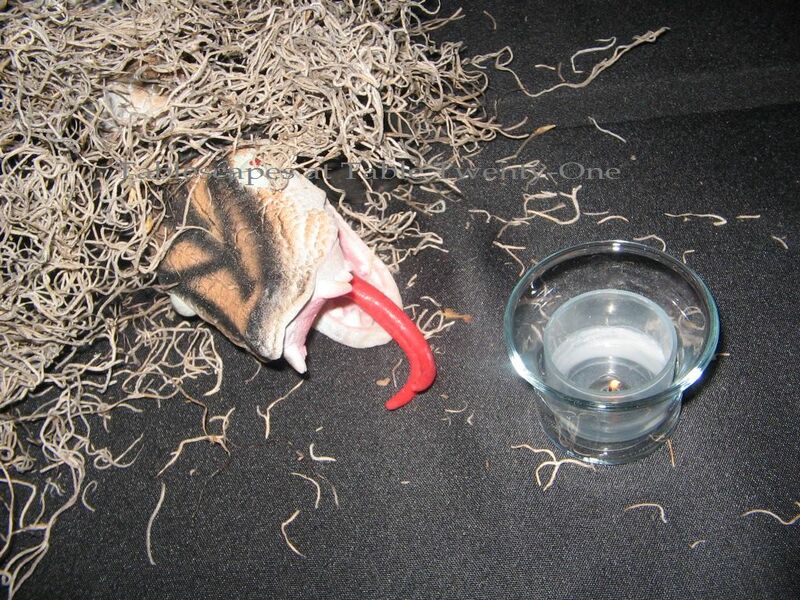 I love your table, but you about lost me with the snake…I really hate snakes! 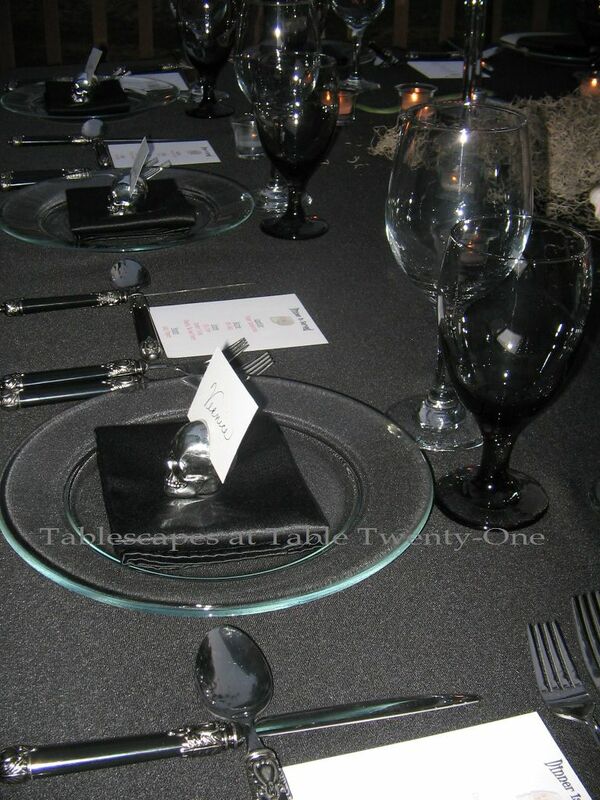 I love that flatware…perfect for this table. Even though it’s not your favorite, hope your Halloween is Happy! Have a great weekend. You outdid yourself on creativity for this one. I wouldn’t have been able to come close to eating at that table due to my fear of snakes, even plastic ones. Loved how you crossed the knife with the spoon. So clever. On childhood memories, my parents never let us 5 kids Trick or Treat so I didn’t have those experiences. I decorate for fall at my house but not Halloween. 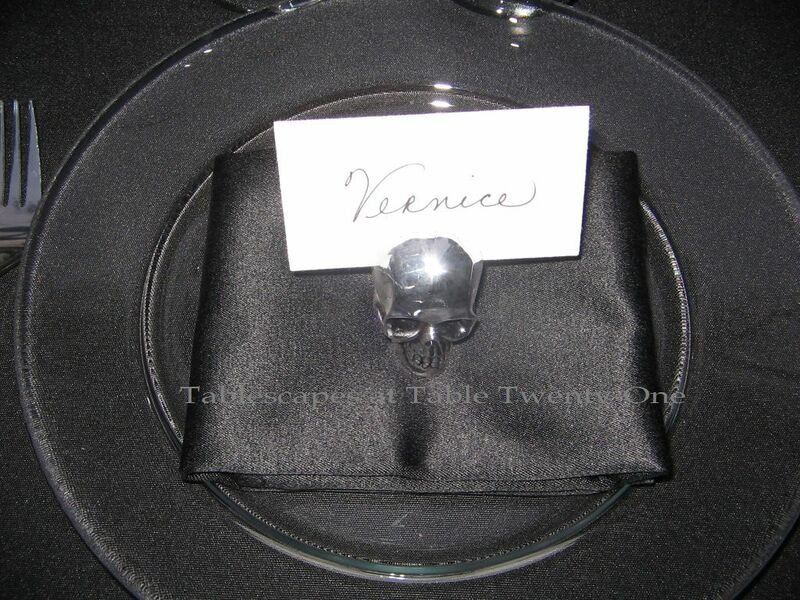 Cute elements on your table like the skull head placecard holders, use of black linen and clear plates. OMG! I don’t like spookie ambiance, Lady A!!! In a way, I so LOVE the way you put your spookie treasure together. It really scary. Happy w/end, dear Lady A. Enjoy the Halloween. 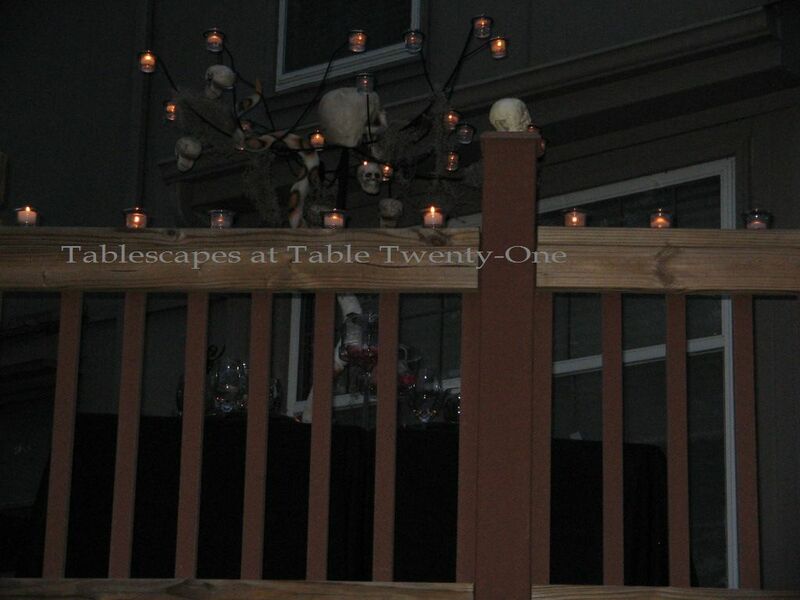 Oh my goodness a very spooky table-scape! I was painfully shy as a kid and always dreaded Halloween and generally made myself sick with anticipation, so I can relate to your feelings. You did create a lovely table though, so you must like a teensy bit of it! Alycia!!! EEEEWWW! This is so fun and g.r.o.s.s!